New launcher is derived from nuclear-bomb-carrying ballistic missiles. 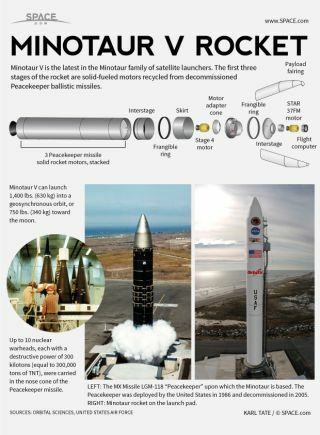 The Minotaur V rocket is the latest member of the Minotaur family of satellite launch vehicles designed and built by the Dulles, Va.-based company Orbital Sciences Corp. The first three stages of the five-stage Minotaur V rocket are solid-fueled motors recycled from Peacekeeper ballistic missiles. When fully assembled, the Minotaur V is capable of launching small satellites on high-energy trajectories, including geosynchronous transfer orbits and trans-lunar trips. The rocket stands 80 feet (24 meters) tall and is about 7.6 feet (2.3 m) wide. When fully fueled, it weighs 197,034 pounds (89,373 kilograms). The Minotaur rocket can launch payloads of up to 1,400 pounds (630 kg) into geosynchronous orbit and payloads of up to 750 pounds (340 kg) towards the moon. The first Minotaur V rocket will launch from Pad 01A from the Mid-Atlantic Regional Spaceport at NASA's Wallops Flight Facility on Wallops Island, Va., on Sept. 6, 2013. The mission will launch NASA's Lunar Atmosphere and Dust Environment Explorer, a 100-day moon dust mission.